As a part of our ongoing commitment to our clients, Purple Palm Vacations spends a lot of time learning about popular destinations by visiting them firsthand. Recently while in Jamaica, we had the pleasure of touring the lovely Couples Negril, an all-inclusive resort for couples. This resort impressed us with its beautiful location on Bloody Bay Beach, lush tropical grounds, and all the extra amenities that are included in every stay. Couples Negril sits on one of the best beaches in Jamaica. Take a photo tour and see for yourself the authentic Jamaican beauty of Couples Negril. All pictures were taken during our tour and none have been modified or enhanced. Located on 18 lush acres facing famed Bloody Bay, Couples Negril is the quintessential all-inclusive resort for couples looking for an authentic Jamaican experience. Lively and low key, this intimate resort is situated on a secluded stretch of pure white sand. In addition to the usual included meals and drinks, Couples Negril includes scuba diving, off-site excursions, unlimited golf, tennis and more! There are more water activities included than at most all-inclusive resorts including Kayaking, Paddleboards, Snorkeling, Glass Bottom Boat Ride, Hobie Cat, Waterskiing, Windsurfing, Sailing, Wakeboarding, and Scuba Diving. Unlimited Golf with transfers and Tennis with lessons are included at no extra charge. Complimentary shopping shuttles to the town of Negril are offered on Mondays, Wednesdays, and Fridays. Shuttles to a scenic local sunset bar are available four times weekly at no charge. Other complimentary off property excursions include Wednesday trips to Margaritaville, Catamaran Cruises, and Reef Snorkeling Excursions. The fitness center has a fully equipped cardio room and a separate aerobic studio with kickboxing, couples massage therapy, and yoga classes. This boutique resort has 234 casual rooms & suites with fresh colors, bold fabrics, and striking local artwork. Each room is complete with a personalized mini-bar, iPod docking station, in-room safe, coffeemakers, iron, and ironing board. Also included are continental room service, private balcony & nightly turndown service. Suite guests enjoy nightly in-room hors d'oevres, an in-suite dinner menu, and a balcony hammock for two. Two re-usable water bottles are included in every room to save on plastic. Water filling stations are located throughout the resort. Couples Negril is a 1 1/2 hour drive from the Montego Bay airport and includes round-trip transfers and exclusive access to Couples arrival lounge. 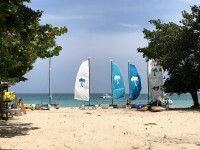 The resort is located on the West Coast of Jamaica and is 5 miles from the small fishing village of Negril. Couples is situated on 18 acres facing the crescent shaped Bloody Bay on 1,000 feet of white sand beach. Ricks Cafe is a nearby bar, popular for cliff diving and spectacular sunset viewing.